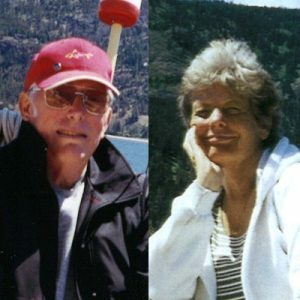 The family of the late Vernon and Janice Erickson share the news of their passing – Janice on November 20, 2018 and Vernon on January 16, 2019. A beautiful love story – lives well lived. Remembered by their loving family: sons Mark (Tiffany) and grandson Tyler; David (Julie) and grandchildren Nicole and Dustin; and John; great-grandchildren Evan and Dylan; Vernon’s sisters Myrna and Sonja and their families; and Jan’s brother Ken and his family. We send our condolences to all of you at this challenging time of transition in your lives. We love your parents. Fond memories of Jan and Vern echo again in my heart of so many, many good times with such good friends! I especially remember those pancake breakfasts in Vanderhoof where we first became good friends! I’ll miss them so much ’til we meet again! We lived in Vanderhoof at the same time as your parents but really got to know them here in Kelowna. We frequently had lunch with them, alternating between their home and ours and after lunch we played Canasta. We so enjoyed them . We enjoyed your mother’s apple pies and super soups and we enjoyed how your Dad just burst into song, singing songs to fit whatever the topic of discussion was. We send our sincere sympathy to all of you and you families. I was so sad to learn of Vern’s death. Both he and Jan were very good friends. I learned from Joyce P., thus the late acknowledgement. Please let me know when you are going to take them sailing. I would like to be there. Deep sympathies to you all. Sandy Stephen.